This drug is not approved for human use. CAUTION: US Federal law restricts this drug to use by or on the order of a licensed veterinarian. Revolution kills adult fleas and prevents flea eggs from hatching for one month and is indicated for the prevention and control of flea infestations(Ctenocephalides felis), prevention of heartworm disease caused by Dirofilaria immitis, and the treatment and control of ear mite (Otodectes cynotis)infestations. Revolution also is indicated for the treatment and control of sarcoptic mange (Sarcoptes scabiei) and for the control of tick infestations due to (Dermacentor variabilis). Revolution kills adult fleas and prevents flea eggs from hatching for one month and is indicated for the prevention and control of flea infestations(Ctenocephalides felis), prevention of heartworm disease caused by Dirofilaria immitis, and the treatment and control of ear mite (Otodectes cynotis)infestations. Revolution is also indicated for the treatment and control of roundworm (Toxocara cati) and intestinal hookworm (Ancylostoma tubaeforme)infections in cats. Not for human use. Keep out of the reach of children. In humans, Revolution may be irritating to skin and eyes. Reactions such as hives, itching and skin redness have been reported in humans in rare instances. Individuals with known hypersensitivity to Revolution should use the product with caution or consult a health care professional. Revolution contains isopropyl alcohol and the preservative butylated hydroxytoluene (BHT). Wash hands after use and wash off any product in contact with the skin immediately with soap and water. If contact with eyes occurs, then flush eyes copiously with water. In case of ingestion by a human, contact a physician immediately. Administer the entire contents of a single dose tube (or two tubes used in combination for dogs weighing over 130 pounds) of Revolution topically in accordance with instructions. At the discretion of the veterinarian, cats ≥6 months of age may be tested to determine the presence of existing heartworm infections before beginning treatment with Revolution. Cats already infected with adult heartworms can be given Revolution monthly to prevent further infections. Revolution has been tested safe in over 100 different pure and mixed breeds of healthy dogs and over 15 different pure and mixed breeds of healthy cats, including pregnant and lactating females, breeding males and females, puppies six weeks of age and older, kittens eight weeks of age and older, and avermectin-sensitive collies. A kitten, estimated to be 5-6 weeks old (0.3 kg), died 81/2 hours after receiving a single treatment of Revolution at the recommended dosage. The kitten displayed clinical signs which included muscle spasms, salivation and neurological signs. The kitten was a stray with an unknown history and was malnourished and underweight. DOGS: In safety studies, Revolution was administered at 1, 3, 5, and 10 times the recommended dose to six-week-old puppies, and no adverse reactions were observed. The safety of Revolution administered orally also was tested in case of accidental oral ingestion. Oral administration of Revolution at the recommended topical dose in 5- to 8-month-old beagles did not cause any adverse reactions. In a pre-clinical study selamectin was dosed orally to ivermectin-sensitive collies. Oral administration of 2.5, 10, and 15 mg/kg in this dose escalating study did not cause any adverse reactions; however, eight hours after receiving 5 mg/kg orally, one avermectin-sensitive collie became ataxic for several hours, but did not show any other adverse reactions after receiving subsequent doses of 10 and 15 mg/kg orally. In a topical safety study conducted with avermectin-sensitive collies at 1, 3 and 5 times the recommended dose of Revolution, salivation was observed in all treatment groups, including the vehicle control. Revolution also was administered at 3 times the recommended dose to heartworm infected dogs, and no adverse effects were observed. CATS: In safety studies, Revolution was applied at 1, 3, 5, and 10 times the recommended dose to six-week-old kittens. No adverse reactions were observed. The safety of Revolution administered orally also was tested in case of accidental oral ingestion. Oral administration of the recommended topical dose of Revolution to cats caused salivation and intermittent vomiting. Revolution also was applied at 4 times the recommended dose to patent heartworm infected cats, and no adverse reactions were observed. 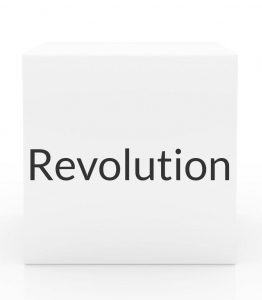 In well-controlled clinical studies, Revolution was used safely in animals receiving other frequently used veterinary products such as vaccines, anthelmintics, antiparasitics, antibiotics, steroids, collars, shampoos and dips. STORAGE CONDITIONS: Store below 30°C (86°F).